Pre-Order your copy of "refugeeum" NOW! you can PRE-ORDER our new album REFUGEEUM now in our bandshop. Release date is 24th july but you can order now and get your copy in time until/before the 24th july. We offer superheavy classic black double-vinyl incl. free CD, a special strictly limited edition of WHITE vinyl (2LP, superheavy, free CD) and a traditional digisleeve-CD. Go, make your choice! 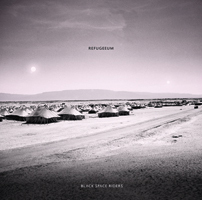 "REFUGEEUM" is the title of BLACK SPACE RIDERS' new album which will be released this summer. It's an album about refugees ... about expulsion and escape. In the end of march we will be starting to record our 4th album. Never change a winning team! We are very happy to record at "die Tonmeisterei " in Oldenburg , again with our dear friend Role Echolotse, who also took care for our our last album "D:REI" as well as for the both albums before. We are hoping to release the new album this summer (2015). Keep contact, we will keep you up to date with pictures and information during our recording time. Back from a night in the rehearsal room. Writing songs, jamming, arranging. Wow ... Where is all this music coming from?